Article by Alan Smart in Berlin; Monday, Dec. 21, 2015. 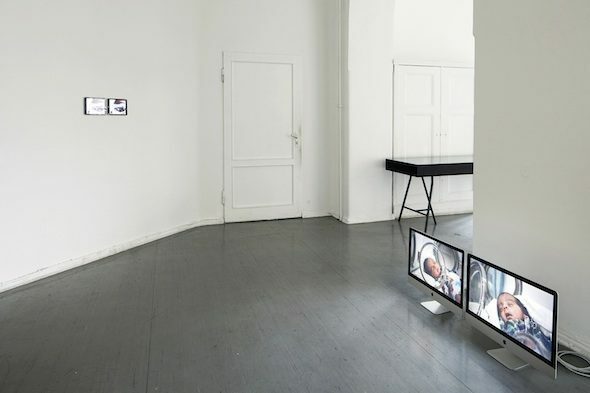 Regarding Spectatorship: Revolt and the Distant Observer, curated by Marianna Liosi and Boaz Levin, is the latest in a series of exhibitions at Kunstraum Kreuzberg/Bethanien, which offers an account of the contemporary condition by pulling works and practices from out of history and into the present. Unlike Context is Half the Work: A Partial History of the Artist Placement Group, the excellent but more strictly historical show preceding it, Regarding Spectatorship includes material presented as archival artifacts, pieces by iconic artists already tied to established historical moments, and more contemporary work addressed to the still-amorphous sphere of ‘current events.’ In framing spectatorship, the curators invoke Jacques Rancière’s concept of the “emancipated spectator” that seeks a way out of the dead-end condition Guy Debord termed the “society of the spectacle” in which the image regime of semio-capitalism obscures material reality and turns us all into mystified, paralyzed watchers, incapable of effective political action. While Rancière tends to focus on the “events of May 1968” and their “failure”, Liosi and Levin locate the origin of their politics of virtuality more broadly in the 1970s. 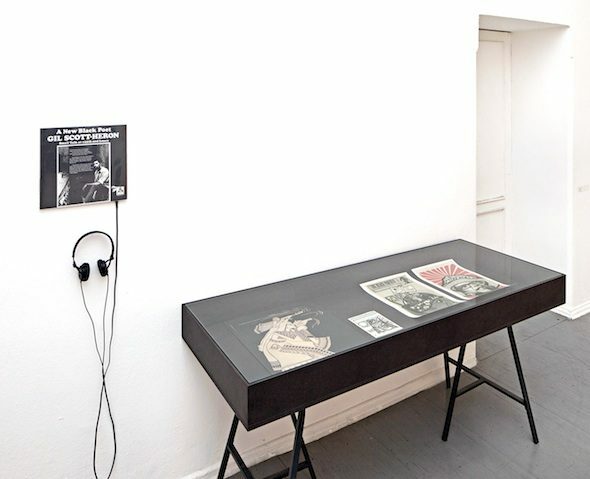 The exhibition is tied together with a line of vitrines containing “archival” Black Panther publications and ephemera from Italian Autonomist Radio Alice, and a listening station playing Gil Scott-Heron’s ‘The Revolution Will Not Be Televised.’ The present is identified not, however, as television consumer culture but of the atomization of social networks and the simultaneous distance and immediacy they create with political events. A series of projects by Massimo Grimaldi, entitled EMERGENCY use the latest Apple products to screen lush, sentimental images of hospitals set up in such telegenic global trouble spots as Afghanistan, Sierra Leone, and Sudan. The hospitals, however, turn out to have been set up specifically for the art pieces, using funds allocated for their production, so that they are figured primarily as sites for the production of the kitschy, affirmative images, whose ‘staging’ incidentally involves the creation of a real, working hospital. 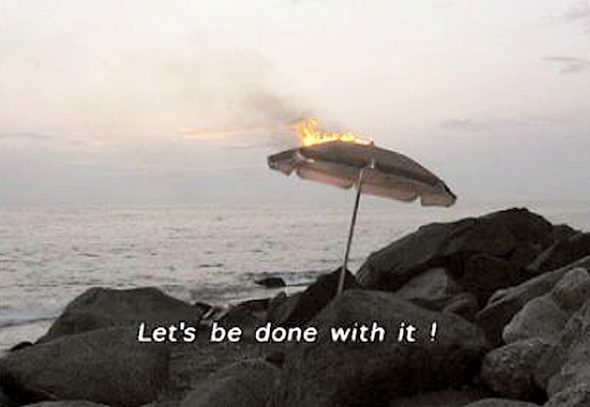 The question of the staged versus the real is framed differently in the video piece ‘Get Rid of Yourself’ by the Bernadette Corporation, in which raw, amateur footage of the riots protesting the 2001 G8 meeting in Genoa are interspersed with clips of their own vacation in the south of France. There is voice-over narration in which Chloe Sevigny reads a text by Tiqqun about getting away, escaping oneself and about a longed-for revolutionary moment in which there is no longer any scripted scenario to follow and the world is open. In the timescale of the show — compressed not to generations so much as news cycles or fashion seasons — both Sevigny and the ‘Invisible Committee’ appear as retro revivals of past celebrity, infused with the ironic fission of John Travolta or Pam Grier’s showing up in a Quentin Tarantino movie. The actors appear as a citation of themselves, stepping not out of the frame into the world but somehow from one stage to another. 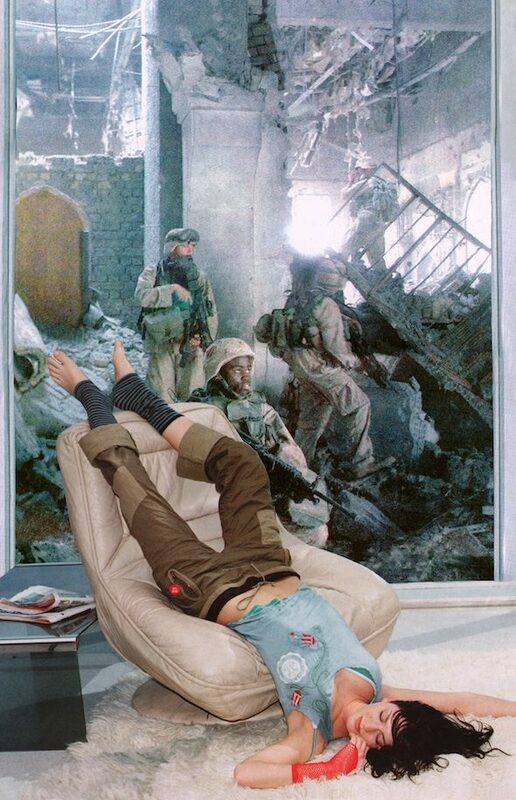 This recursive sampling is even more explicit in ‘Lounging Woman and Grey Drape'(2004), where Martha Rosler remixes her now-iconic Bringing The War Back Home collages of soldiers in Vietnam inserted into domestic interiors from glossy magazines, with scenes from the Gulf War juxtaposed with imagery from fashion advertising. This now appears again with a new war and humanitarian crisis in the background that western observers experience as a collage of shocking images mixed into the quotidian banter of Facebook. How this critical watching, and deft navigation of memes — the aesthetic skill set of the hipster — adds up to an active, or activist politics is not resolved in Regarding Spectatorships. This is as it should be. Rather than asserting an alternate scenario, that would be just as much a foreclosure as the ones that weigh on the present, the exhibition poses the question, and induces the Brechtian feeling of discomfort that jars both smug cynicism and earnest affirmation, that gets us out of our seats — or away from our tiny, private screens — and perhaps points the way back out into the streets. The exhibition includes works by: Abbas Akhavan, Özlem Altin, Gilad Baram, Bernadette Corporation, Harun Farocki, Massimo Grimaldi, Sharon Hayes, Daniel Herleth, Darius Kazemi, Ken Lum, Falke Pisano in collaboration with Archive Books, Martha Rosler, David Reeb, Sandra Schäfer, Allan Sekula, Peter Snowdon and Ian Wallace.